Many guitarists consider amp attenuators to be an essential part of their playing set-up, especially those using valve or tube amps. The attenuator goes in between the power and the speaker sections of your amplifier, converting a portion of the energy into heat rather than sound. As opposed to just turning down the volume, which can make your sound thin or weak, an attenuator lets you get the full sound of your amp without blowing out your eardrums every time you practice. A good attenuator will not alter your tone when it’s installed correctly, but just like with any piece of gear, choosing the right model is important to maintaining your overall sound. The most important thing is to look for a model that can handle the power your amp puts out. 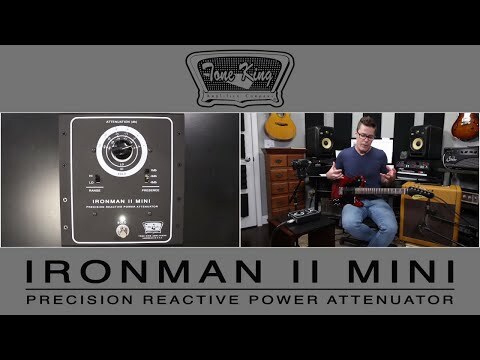 If you’ll be using it for multiple amps, get one that can handle the amp with the highest power rating; using a higher-powered attenuator with a lower-powered amp won’t cause any sound distortion, but using an attenuator that can’t handle your amp’s power could cause damage to both pieces of equipment. 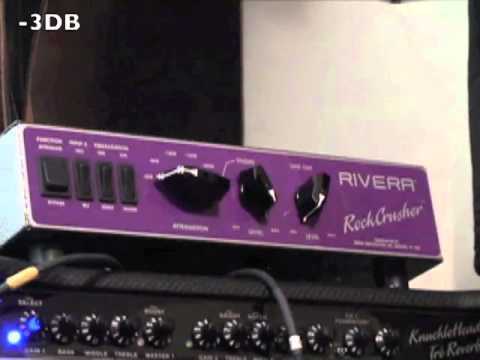 The RockCrusher works with even the most powerful amplifiers without distortion. By using a reactive instead of resistive load, the RockCrusher maintains the impedance relationship between the speaker and the amplifier. Not only does this give you a better tone at every dynamic, it prevents damage to both the amp and the speaker. 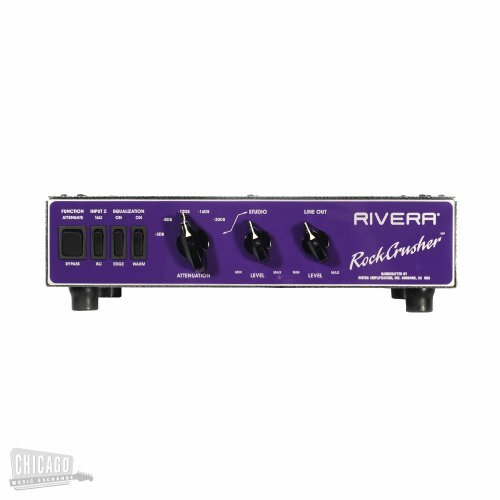 The RockCrusher also gives you lots of options for adjusting your tone and volume (see full specs). The attenuation switch has six settings in 4 decibel increments and it’s got two EQ switches (Edge and Warm) that can brighten or darken your tone until it’s perfect for your ears. This should belong on anyone’s list of the best amp attenuator. Weber is a trusted name in guitar equipment, and the MicroMass stays true to their standard of quality. Use the Lows-Mids knob to control the master volume, then tweak the treble with the Mids-Highs knob to either brighten or warm up your tone. It’s compatible with amps between 4 and 16 ohms and gives you complete control down to -50 decibels attenuation. The MicroMass uses a speaker motor for the load, giving the attenuator more interaction with the amp’s output circuit and making the load more realistic. This minimizes tone loss at all levels of attenuation, making the MicroMass one of the most transparent attenuators on the market. Another option from Weber is their Mass III, which you can think of as the full-sized version of their MicroMass above. Compared to the MicroMass, you’ll get more power and a wider range of controls. It also has two output jacks for rigging up multiple cabinets, making it a more versatile option than the smaller MicroMass. The trade-off, of course, is that it carries a bigger price tag, but for what you get it’s well worth the extra investment. 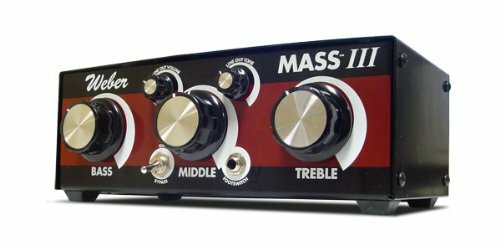 If there’s one feature of the Mass III that’s most noteworthy, it’s that it has a tone stack for the signal (see full specs). There are individual controls for the bass, mid-range, and treble, so you can adjust the balance of your sound easily. This can be a bit intimidating if you’re not used to having this level of control, and you may need to fiddle with it a little bit to figure out how to get the right tone. Once you’ve mastered the operation, though, the Mass III can adjust your output without destroying your tone. You’ll especially notice the difference in the treble range. A lot of attenuators cut off the top of your tone, but that’s not a problem with the Mass III. It’s arguably the best amp attenuator for the money. It’s honesty incredible that Tone King’s managed to fit this many features into such a small pedal. This impressive little 30-watt attenuator pedal is a footswitchable powerhouse that gives you complete control over your dynamics, giving you everything from a whisper to a scream without losing your tone. In terms of the price, the Ironman II is an investment. It’s the only pedal you’ll find out there that gives you a variable boost on a footswitch, though. That capability is worth paying a bit extra for. 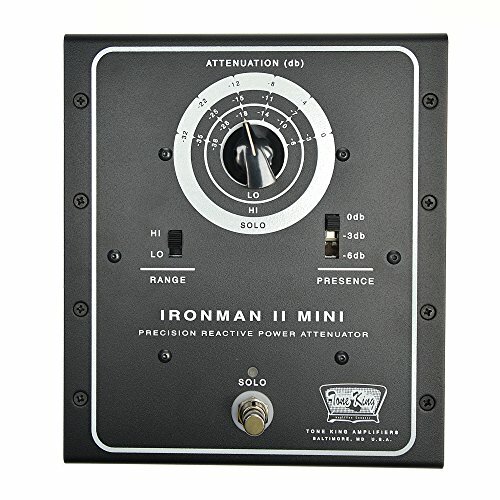 The Ironman II gives you real time control over your volume at a level of precision no other attenuator can offer. The compact and durable all-metal casing it’s housed in guarantee it’ll be in your rig for years, no matter what kind of rough travel it’s put through. How you install your attenuator will depend on what kind of amplifier you’re using. If you have a combo amp, you want to put the attenuator between the speaker and the amp’s speaker out. You can do this by unplugging the speaker from the amp then running a speaker cable from the amp speaker output to the attenuator’s input. Plug the speaker into the speaker output of the attenuator (not the “line out”) and you’re good to go. Use as little cabling as you can to make these connections; the shorter the cable, the lower the signal loss will be. If you’re using a piggyback arrangement with an amp head on top of the cabinet, you’ll want to plug the amp head into the input of the attenuator, then plug the cable from the attenuator’s output port into the cabinet. Again, make sure you’re in the output and not the “line out” port, and use the shortest cable you can. If you’re putting your attenuator on a rack with other pedals, you should also use care in where you place it. 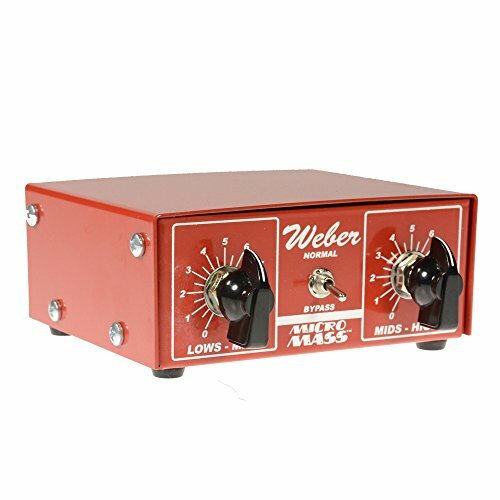 Even models with excellent heat dispersion will get warmer than your typical pedal, so it’s best to put the attenuator in the top position of the rack to keep the heat coming off of it from damaging your other equipment. If it’s not possible to put it on top, leave an empty space above it to allow it room to vent. 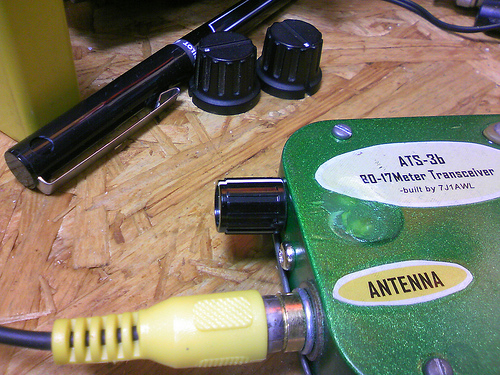 You may have heard horror stories about attenuators causing resistor failures in amplifiers. While this does happen, it’s completely preventable if you understand the dynamics at work inside your equipment. Just because your amp sounds softer when you’re using an attenuator doesn’t mean it isn’t putting off the same power. 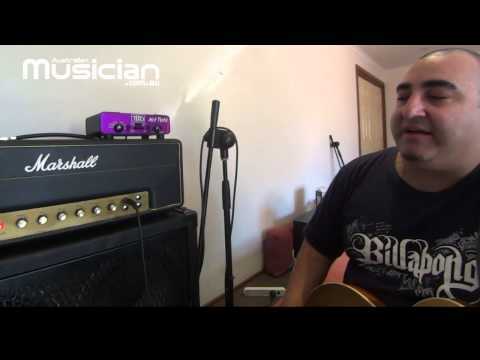 The whole point of an attenuator is to be able to get the sound of your amp at full power. Most tube amps sound best when they’re going full force, but working them that hard consistently does cause the tubes to wear out faster. If you play your amp at full power on a regular basis, you’ll probably need to replace the tubes about once a year, though the exact time can vary depending on your particular set-up. Generally, it’s a good idea to replace them when you start hearing a change in the sound quality—typically this will start with a less articulated and muddier bass response. Replacing the tubes when they start to wear out will prevent the kind of catastrophic blow-out that causes damage to the rest of your amp. Well, we hope you’ve found the best amp attenuator for your needs and a few helpful tips to boot. Good luck!